From the top of Tam McArthur Rim, distant peaks appear just a short hike away. THREE CREEK LAKE, Ore. — A shroud of thick, gray smoke blocked the view of the Cascade mountains to the north, but to the west, the Three Sisters and Broken Top shined in all their snow-spotted brilliance. From the top of Tam McArthur Rim, the peaks appeared so close that they seemed maybe just a short hike away. With so many hiking possibilities in Central Oregon, sometimes it is hard to find one with the ideal combination of the right distance, difficulty, duration and payoff (views). 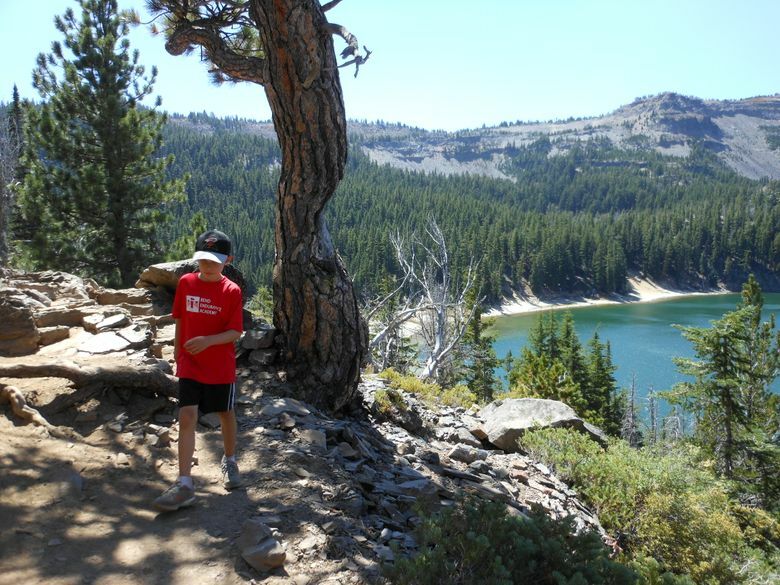 Climbing South Sister or hiking around Broken Top are both all-day commitments and physically demanding treks. I told my son Mason we can try South Sister when he turns 12. For now, I need to seek out hikes with the right combination to challenge but not deter a 7-year-old. The 5.3-mile round-trip hike to Tam McArthur Rim is the perfect fit. The outing includes 1,410 feet of elevation gain — the high viewpoint sits at 7,730 feet — and typically requires no more than three hours. And, of course, it includes the payoff of glorious Cascade views at the top. Or, for Mason, the payoff of a peanut-butter-and-jelly sandwich and Goldfish crackers at the top. The ride from Bend to the trailhead requires about an hour. The road into Three Creek Lake is gravel, dirt and a little bumpy, but the hike is well worth the drive. Mason and I arrived at the trailhead on a recent Wednesday morning, and the parking lot at Driftwood Campground was nearly full. Though a bit of a drive from Bend, Tam McArthur Rim is a popular area in August. Usually, snow prevents hiking access until late spring, but Tam McArthur Rim is also a popular backcountry ski destination during the winter. Its steep north-facing slopes offer perfect lines for skiing and snowboarding. On this day, though, the snow was completely gone except for one tiny patch near the summit. The trail started just across the road from Three Creek Lake and took us up dusty switchbacks to the opposite side of the rim. Views of the lake and North and Middle Sister popped up to the west as we climbed. Eventually, the trail flattened out as we seemed to reach the crest of the rim along an open plateau. The section was hot and treeless, and luckily I had lathered the sunscreen on the two of us as the sun was expected to be bright, driving temperatures into the 90s. As we made the last push to the viewpoint, craggy, jagged Broken Top dominated the horizon to the west. I could tell we were about to finally top out onto the dramatic edge of the rim and see the view to the north. Although smoke from Oregon wildfires marred the potential view of Mount Washington, Three Fingered Jack, Mount Jefferson and Mount Hood, the trail along the edge of the rim did not disappoint. We could look down and see Three Creek Lake and Little Three Creek Lake, and as we arrived at the top, North and Middle Sister jutted skyward to the west. We enjoyed our lunches and a well-deserved break at the top while we took in the views. According to the Oregon Historical Society, the rim is named for Lewis A. McArthur, known as “Tam” McArthur, who was an executive for Pacific Power & Light Company and was also the secretary for the Oregon Geographic Board for many years. In 1928, McArthur published his book “Oregon Geographic Names,” which, now in its seventh edition, is a comprehensive source on the origins of Oregon place names. Mason and I spent about 45 minutes exploring the top of the rim and dodging sneaky chipmunks looking for food before deciding to make our way back down. The trail officially ends at the viewpoint, but we were able to continue west along the rim before circling back to the trail we had hiked up. The trail overall was steep in some sections but relatively easy and nontechnical — perfect for families seeking out some of the most beautiful spots in the Cascades of Central Oregon. Directions: From downtown Sisters, Ore., turn south onto Elm Street. Elm Street turns into Forest Service Road 16. Follow this road for about 15 miles to a fork in the road about a mile after the pavement ends. Stay right at the fork on FS-16 and continue for about 0.8 mile to the trailhead. There is a small parking lot at the entrance to Driftwood Campground, and parking is available on either side of the road.